Ka Huna means 'keeper of the secret' and a Ka Huna specialises in the fields of medicine, herbs or healing. The KaHunas of long ago were priests who practiced their healing with much reverence, love and spirituality. To maintain health, the Hawaiian's practice constant cleansing of the emotions in mind, body and spirit. Healing occurs in different ways. All people are believed to be connected to their surroundings, so an illness is a result of what you're in contact with - other people, your work, land, air or water. Healing your surroundings also is part of healing your body. Hawaiians believe there is a reason for everything and time will reveal those reasons. Massage is used for healing, detoxifying and energising, along with Pohaku massage using hot stones on the body. Each family also used massage (lomi lomi) a slightly different style to Ka Huna, as part of their family life; giving healing to each other regularly. 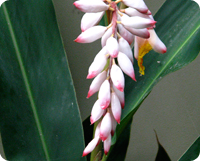 Ti Leaf was also used and is still used extensively in cooking, decoration, cleaning, making leis and herbal treatments. For thousands of years, adolescents in Hawaii took part in a rite of passage ritual that involved a week or more of massage and healing. Performed by KaHunas, they used it specifically to help release emotional blocks, negative thoughts and feelings and enabled their young people to become responsible adults. At the right time they would be led to a sacred area, usually a cave, where the healing would take place. This healing would go for many days or weeks until the teen was ready to take his/her place within their village with a new mature outlook and inner strength. It was also used at times of change in a persons life; a marriage, becoming an elder, after a death or birth and also given to their honoured royalty. It helped them move through major personal and spiritual transitions by getting in touch with the deep aloha within. A focused meditative dance movement. This movement reflects a local bird, the albatross, and is called 'the flight of the navigator' or flying. This large bird is respected for it's stamina (long flights) and resilience. The therapist uses this flying to maintain energy and move around the massage table with ease. Below are the 7 spiritual principles which create the core philosophy of Hawaiian Huna. These principles have come from the wisdom of the ancient ones. IKE - Be aware of your thoughts, words, attitudes and actions. Each of us is responsible for our own destiny. I am aware. KALA - There are no limits, be free! In the most creative and innovative ways. I am free. 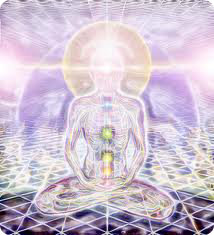 MAKIA - Energy flows where attention goes - Be Focused. MANAWA - Now is the moment of power - Be Here. ALOHA - To love is to be happy with - Be Happy. MANA - All power comes from within - Be Confident. PONO - Effectiveness is the measure of truth - Be Positive. According to Kahuna legend, this ancient symbol radiates energy that increases happiness and good fortune. 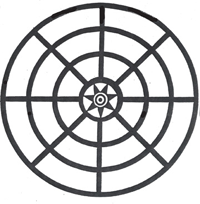 The circles are unconditional love, (Aloha), branching lines represent divine power (Mana) and the 8 circles and lines represent abundant good. (Pono) The symbol is said to be a channel for the blessing of the location it's placed in or whoever sees it.